Thursday, 22 December 2016 will see the relaunch of Blouberg’s Club Lenin located on the Blouberg Beachfront, after a multi-million-rand upgrade. The state of the art club forms part of the “It Experience” that encapsulates a cocktail bar and restaurant on the ground floor, It Café, as well as V-slots gaming lounge for those feeling lucky, with Club Lenin located on the first floor featuring biometric fingerprint access and awe-inspiring audio-visual effects. With a keen interest in some of the rarest and most exotic supercars available, owner Ahmed Essop, will offer 2 lucky guests the chance to arrive in style and be whisked home safely in a luxurious Maserati that will form part of the arrival experience on the night. Guests are encouraged to take the opportunity to dress impressively and bedazzle the crowds with the chance to be snapped by the photographer and videographers who will be capturing highlights of the evening throughout the event. 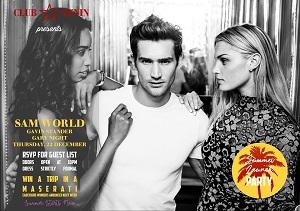 Club Lenin will be looking for beautiful brand ambassadors on the night. On the decks, guests can expect the club’s in-house residents Sam World, Gavin Stander & Gary Night. Entrance is strictly by guest list only for trendsetters over the age of 21. Please email jami@redcarpetconcepts.co.za for guest list to what is set to be the definitive festive season party starter in the Blouberg region.